Region: This leafhopper can be found in western North America, but similar species can be found in many other areas. Life cycle: This insect produces many generations each year and hibernate as an adult amongst weeds. 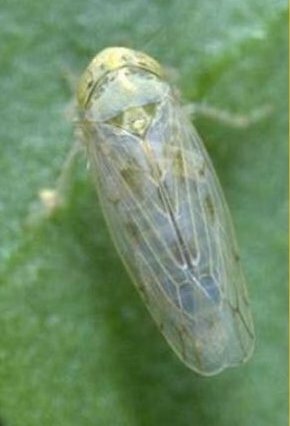 The leafhopper lays its eggs in March and the adults swarm from early May to June. Physical Description: This 1/8 to 1/5 inch long leafhopper is pale green or yellow, is wedge-shaped, and becomes darker toward the winter. This bug is very similar to the potato leafhopper. The nymph is also pale green like the adult. The eggs are yellow and are laid in the stems of plants. Feeding characteristics: This pest will attack bean, beet, potato, and tomato plants and carries "curly top" and "tomato yellows" that causes the plants to be stunted and deformed. The symptoms are warty, pronounced leaf veins, kinked petioles, rolled leaves that look cupped or ball-like, brittle, masses of hair-like growths on the taproots. Lacewing larvae will attack and eat the leafhopper nymphs. Pull affected plants as soon as the symptoms are noticed and clear the area of weeds. Replace the weeds with perennial native bunch grasses (more than one species is better), since this insect tends to avoid grasses. If problem persists, dust your plants lightly with Diatomaceous earth.